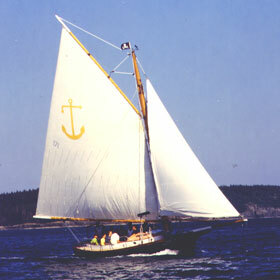 Resolute's design and rigging are typical of the sturdy craft favored by fisherman when their work was still done under sail. She's an authentic Friendship Sloop, a craft renowned for its comfortable ride and spacious cockpit. We are coast guard inspected annually and certified to carry 15 passengers. Passengers can participate in sailing the boat or simply sit back and take in the spectacular view, the picturesque islands that dot the North Shore coast or Boston Harbor. We have spent most of our lives sailing the coastline of New England and will gladly answer any of your questions about the area's local history and natural heritage. See our pricing chart for details. Sailing Club Memberships available. Click here for details. 23' Ensign "Coda and Stolen"
"To create a stiff, safe, comfortable vessel [fully capable of extended offshore cruising] with a conservative yet pleasing appearance, a practical uncomplicated ageless design with perpetual value." *Before renting any of our boats for the first time, you will need to take a short check out sail with us to demonstrate your ability to sail independently. 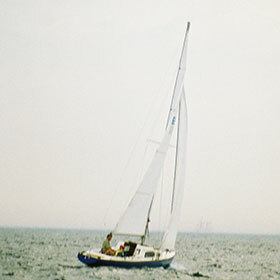 Check out price is $35 in addition to your initial sailboat rental fee. If you are interested in sailing, but do not meet our safety and seamanship requirements, you are welcome to join us for a private refresher sailing course, or for a complete "Learn to Sail" program in one of our group sailing classes. Upon successful completion of our courses, you can then rent one of our sailboats and get out on the waters on your own!